Located next to the ski domain of La Plagne Paradiski (1,250 - 3,250m) with 242 slopes and 425 km between La Plagne and Les Arcs, the hamlet of Montgesin is at an altitude of 1,500 m and linked to the ski resort by a snow path of about 2.5 km (beginner level). It goes by our property and leads to the ski resort of Montalbert (altitude of 1,350m). You can return to the chalet by skiing from the Plateau of Dou de la Rama (altitude of 1,623m), directly from the slopes on a snow path. In Montalbert (15 min by ski/3 min driving), there are shopping facilities, the ESF (French Ski School) as well as ski rentals. An ESF meeting is also possible above Dou de La plagne (800 m by car). Full description and location map upon request. The hamlet of Montgesin: Montgesin is a small alpine village located at an altitude of 1,500m, built around a 15th century historical chapel. More and more people come to the village mostly because of its quietness and its sun exposure (south and west facing). The hamlet is 3 km above the ski resort of La Plagne Montalbert, accessible by car in all seasons and by ski via a snow path. The hamlet is the starting point of many trails in the middle of nature, perfect for non-skiers, with a beautiful view and environment. 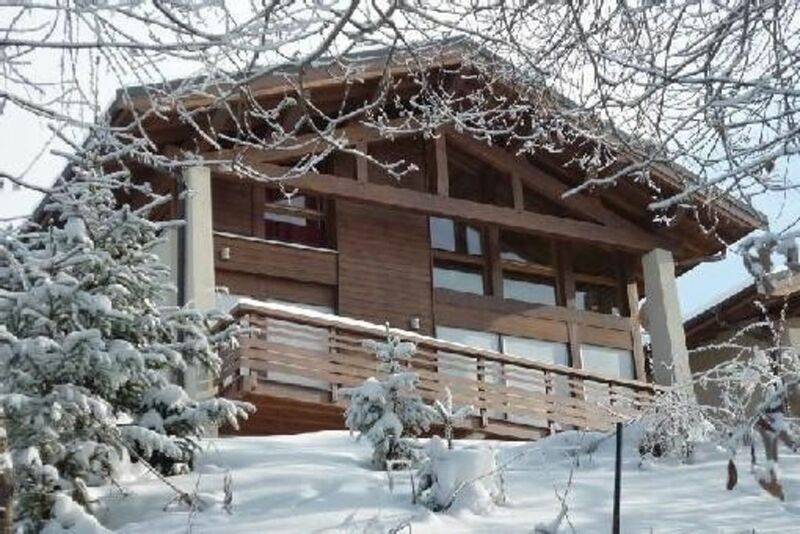 The chalet: completely new, built by an architect specialised in mountain architecture (Cabinet Maironi) in 2009, it has been rated 4 épis (stars) by the Gîtes de France in 2009 (certification available upon request). With a living surface of 180 sq.m on 3 levels, with large balcony: windowed architecture, bright, and opens on to the surrounding nature. The downstream facade is sunny even in winter, thanks to its windowed architecture and Montgesin, which is located on the south-west facing slope. The 2nd level's bedrooms have panoramic bay windows, right above the bed, with an amazing and unique view of the mountains. Tailor made blackout curtains in all the bedrooms. Garden level: 1 shower room with shower, 1 bathroom and separate toilet. 2nd level: 1 shower room with shower, bathtub and separate toilet. Ski room. Garage with automatic door. Wood-burning stove, logs provided. Large balcony. Mezzanine with living area, TV, numerical channels and DVD player. Prestation de qualité et séjour très agreable. C'est la deuxième fois que nous louons ce chalet et nous en sommes super content. Chalet moderne très bien agencé et très bien équipé, à 15 nous nous sommes pas marchés dessus ! Village de Montgesin petit mais charmant, à 5 minutes des pistes au printemps, de très belles randonnées au départ du chalet ! Adresse que nous conservons pour notre prochain séjour pour profiter du domaine de la Plagne. Un grand merci au propriétaire ! Très beau chalet avec des belles prestations. Le cadre est exceptionnel et proche de toutes les commodités. J'avais la tête dans les étoiles ! Dès que l'on ouvre la porte d'entrée, on se sent déjà chez soi, c'est chaleureux, lumineux, spacieux, confortable, décoré avec goût.... la vue est exceptionnelle, du petit matin jusqu'au coucher du soleil ! Merci Monsieur le propriétaire pour cet inoubliable séjour !